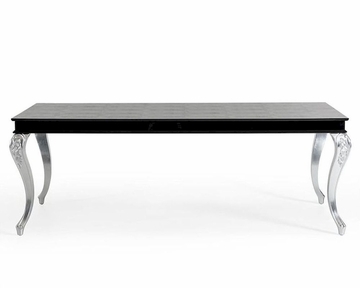 W87" x D43" x H31"
Silver ornate curvy legs accent the large rectangular dining table. As part of the Collection, the dining table features the signature laser-cut crocodile texture on the table top with a rich black lacquer finish. Pair with any dining chair from the Collection to complete the table. Dining Table - W87" x D43" x H31"
Milano Furniture offers mid to high end contemporary and traditional home furniture that is recognized for its innovative design, high quality, functionality, and above all very competitive pricing.